BALASINOR: Jorav'var Khan, Nawab of Balasinor (1827-1882), with his daughter. bl.uk > Online Gallery Home	> Online exhibitions	> Asia, Pacific and Africa Collections	> BALASINOR: Jorav'var Khan, Nawab of Balasinor (1827-1882), with his daughter. 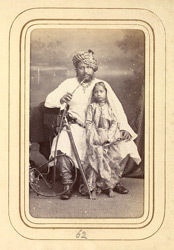 Portrait of Jorav'var Khan (1827-1882), Nawab of Balasinor with his daughter, from the 'Album of cartes de visite portraits of Indian rulers and notables' taken by Bourne and Shepherd, early 1870s. Balasinor (now known as Vadasinor) in Gujarat was ruled by the Nawabs who traced their origin to Sher Khan Babi, an officer in the Mughal service (1664). Salabat Khan expanded their terriotory to include Junagarh but after his death the territory was divided; his elder son held on to Balasinor and the younger son recieved Junagadh. Jorav'var Khan (1827-1882), Nawab of Balasinor succeeded as a minor in 1831 and ruled until 1882. The Nawab is posed smoking a hookah, with his daughter standing in front of him.